10 Hand coloured Lithograph by C. von Schach, Stuttgart ca 1840. WALTER HICK TRUSCOTT, ascribed to oil on canvas signed and dated 1862. 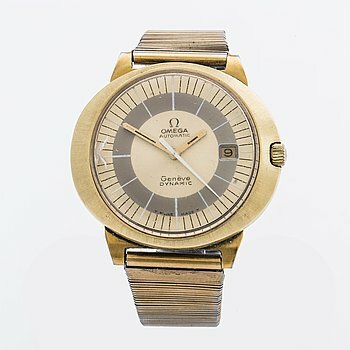 An Omega Genève Dynamic wrist watch. ELLEN TROTZIG, oil on canvas, signed. MAJA BRAATHEN, oil on canvas, signed. ARNOLD "NOLLE" SVENSSON, oil on canvas, signed and dated -02. 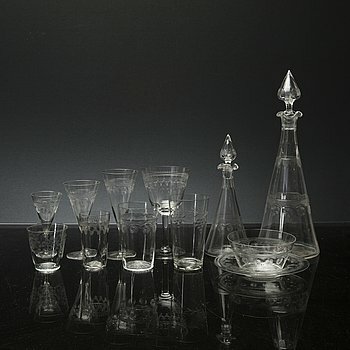 An early 20th century 56+25 pcs glass service. a lounge chair and one stool, model "Sinbad", Cassina, designed in 1981. A 'Graal' gass vae by Eva Englund for Orrefors, signed and numbered 1-84. A Gustavian Style sofa from the first half of the 19th Century. Four early 19th Century chairs. An Oriental carpet. Circa 350 x 254 cm. LONGINES, Master Collection, wristwatch, 40 mm. 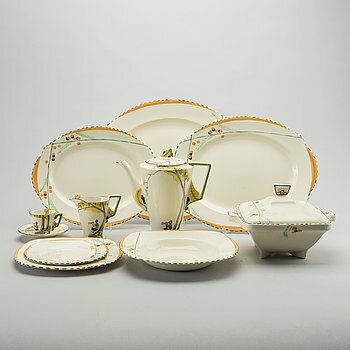 a 20th century dining table. A writing desk, presumably Russia, latter half of the 19th Century. OLOF OTTELIN 1960s Beta-series Sideboard by Oy Stockmann Ab, Keravan puusepäntehdas, Finland. TUIJA LINDSTRÖM, photograph signed on verso. BREITLING, Chronomat, wristwatch, 36 mm. ROLEX, Oyster Perpetual, Datejust, Chronometer, wristwatch, 36 mm. C GÖRAN KARLSSON, sculpture, signed, numbered 36/40 and dated 81. An 'Ovalen' coffee table by Carl Malmsten, late 20th Century. 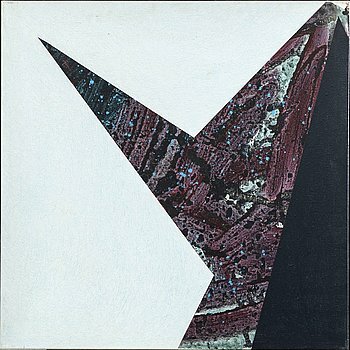 JOHANNES HELDÉN, "Entropy Index". Signed and dated 2009 on verso. CHRONOGRAPHE SUISSE, wristwatch, 37 mm. EVA KLASSON, photograph signed and dated on verso, vintage. JUHANI HARRI, mixed media, signed and dated -65. SJÖÖ SANDSTRÖM, UTC Skydiver, wristwatch, 44 mm. BURBERRY, a cotton velvet jacket, 2017. Italian size 52. A Swedish Empire mirror, first half of the 19th century. CARTIER, Tank, wristwatch, 20,5 mm. An early 20th Century oak dining set. 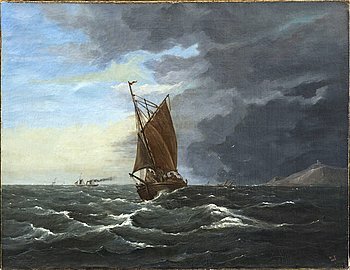 UNKNOWN ARTIST, 19th Century, oil on canvas. SUNE JONSSON, gelatin silver print signed Sune Jonsson. MATTA, Kelim, ca 391 x 301 cm. A runner, kilim, ca 278 x 70 cm. A CARPET, Najafabad, sannolikt, ca 476 x 321 cm. A carpet, Kashan, ca 388 x 303 cm. A CARPET, Nain, 9 LAA, ca 474 x 337 cm. 157 hand coloured plates from Sowerby's "English Botany" Third edition. Vol I, 1849. MOSCHINO, a silk chiffon top and skirt, italian size 38-40. MOSSE STOOPENDAAL, oil on canvas, signed. FROM "SVECIA ANTIQUA ET HODIERNA" Erik Dahlberg 12 copper engraving , ca 1700. LENNART ROSENSOHN, oil on panel signed. MÄRTHA BOLIN-CLASON, oil on canvas, signed. A 19TH CENTURY TABLE WHIT DRAW. A Gucci jacket size IT 40. A brass pendant later part of the 20th century. INGRID DESSAU, a set of 1 table cloth and 8 napkins. A carpet, Ziegler design, ca 492 x 367 cm. A runner, kilim, around 392 x 77 cm. A CARPET, KILIM, AFGHAN, AROUND 517 x 290 cm. A "Tremme" Sofa designed by Børge Mogensen, second half of the 20th century. A CARPET, Kashan, ca 300 x 200 cm. A CARPET, Oriental, around 335 x 276 cm. 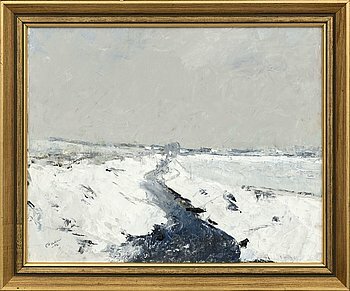 GERHARD NORDSTRÖM, a signed oilpainting on board. 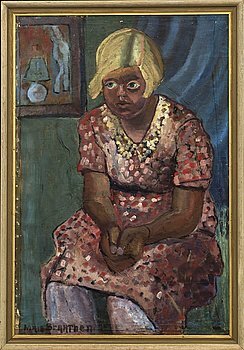 SAM UHRDIN, oil on canvas, signed and dated 1928. A gustavian style table and chairs, second half of the 20th century. A SET OF SIX THONET CHAIRS. A rosewood veneered mirror and chest of drawers from AB Glas & Trä, Hovmantorp, SMI, 1960's. NILS NILSSON, oil on canvas, signed. 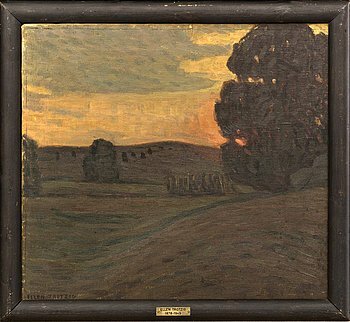 ARVID MAURITZ LINDSTRÖM, oil on canvas, signed. BRUNO MATHSSON, a pair of Pernilla armchairs. A second half of the 20th century garden bench by Riab. A pair of Dsquared toxedo pants size 38. A CARPET, embroided flat weave, around 281 x 200 cm. VICO MAGISTRETTI, a sofa Veranda for Cassina 1980's. A CARPET, Kilim, ca 354 x 261 cm. BULOVA Accutron wristwatch, c:a 38 mm.